UK sales during Black Friday set to surpass £1 billion pounds: digital agency Pulse comments on a new record in retail spending. The days of waiting until Boxing Day for the best shopping deals are a thing of the past, UK shoppers splashed out over £810 million on Black Friday in 2014. Websites were crashing and people were fighting in the aisles, and this year its set to be bigger than ever. 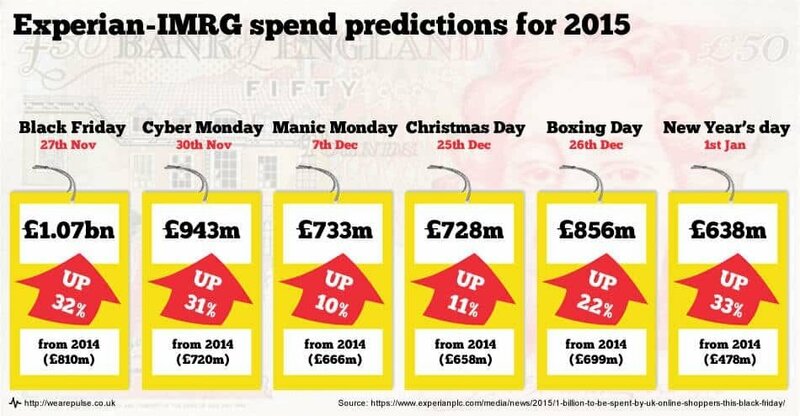 Sales over the 24 hour period are forecasted to surpass £1 billion pounds for the first time ever in UK history. To put that in perspective it means that £11,574 will be spent every second, which looks a little something like this. Pulse is a full service agency specialised in working with forward thinking B2B & B2C brands. With a team of highly experienced digital practitioners, Pulse deliver creative, engaging and robust solutions that are on brief, on budget and on time. Clients include GSK, L’Oreal, McLaren and Olympus.